HIROSHIMA, Japan, Nov. 16, 2016 /CNW/ - Mazda Motor Corporation announced at the Los Angeles Auto Show* today it will offer the SKYACTIV-D 2.2 clean diesel engine in the all-new Mazda CX-5 for North America from the second half of 2017. It will be Mazda's first diesel engine model in the North American market. The SKYACTIV-D 2.2 to be fitted in the all-new CX-5 for North America provides a torque-rich driving experience and revs freely to high RPMs. It will meet the region's strict emission standards and make the all-new CX-5 one of the most fuel-efficient vehicles in its class. The engine also adopts Natural Sound Smoother and Natural Sound Frequency Control, proprietary technologies that reduce diesel knock sound for a quieter and more pleasing sound. Yes and no. North America yes. Doesn't necessarily mean the US market. Mexico and Canada are also North America. From my understanding, the SkyActiv-D still doesn't meet CARB requirements, so I'm still skeptical if Mazda will being the diesel here. Especially considering that 14% of the passenger car diesel market is in California. Mazda made some changes to engine to meet US requirements. TOKYO -- After four years of delays, Mazda Motor Corp. says it will make good on its plan to bring diesel vehicles to the United States, announcing today it will introduce the technology in the new-generation CX-5 crossover next year. As part of a diversification drive, Mazda also will introduce an electric vehicle in 2019 and a plug-in hybrid vehicle in 2021 or later, to meet increasingly stringent fuel economy rules. CEO Masamichi Kogai said his company, one of Japan's smallest carmakers, has cracked the equation of balancing driving performance with clean emissions that had held up a U.S. diesel launch ever since Mazda said in 2010 it would bring its Skyactiv-D engines stateside in 2012. A revamped 2.2-liter Skyactiv-D clean diesel engine, tweaked to meet more stringent U.S. regulations for nitrogen oxide emissions, will be offered in the second-generation CX-5 in the second half of 2017, Kogai said. The next CX-5 debuted today at the Los Angeles Auto Show. The EPA must still give an official fuel economy rating for the CX-5 diesel. But Kogai said it would be among the most fuel efficient rides in the small crossover segment, including hybrids. The fix came through adding a urea selective catalytic reduction, or SCR, treatment to scrub the exhaust of nitrogen oxides, Kogai said. Mazda was able to develop a compact SCR unit that not only reduced its cost but also reduced its impact on engine performance, he said. Further gains in performance came through various tweaks to reduce friction throughout the drivetrain. Mazda spent five years measuring customer feedback to develop the upgrades to the North American diesel engine so that it would be sporty and clean, Kogai said. Mazda is well aware of the uphill battle in convincing U.S. consumers of the charms of diesel now, after Volkswagen AG's rigged diesel emissions scandal tainted the technology's image. Clean diesels account for only around 2.5 percent of the U.S. market, Kogai reckons. Mods, can we get a merge please? Last edited by michael95350; 11-16-2016 at 10:17 PM. I stand corrected if that's the case. The trick will be to see if CARB will be satisfied with these revisions. I don't think Volkswagen's Dieselgate will hurt diesel sales if other manufacturers come to bad. What WILL happen is more scrutiny in getting diesels CARB approved. After all, if California allows them they must be clean. hoorah and TitaniumVT like this. I drove a '13 diesel hatch M6 over in Norway a couple years ago, and I absolutely cannot wait to have that option over here. Please Mazda? Pretty please? I'll even venture to say it -- I think the M6 hatch looks better than the M3 hatch. Sitting in my driveway right now is a 2013 Jetta TDI Sportwagen. It will go away as soon as VW writes the check. 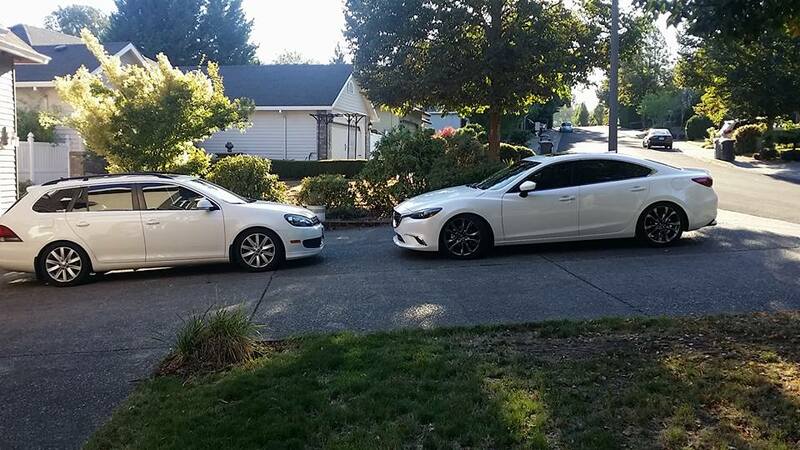 It is parked next to my 2 month old 2016 Mazda 6. If the Mazda 6 diesel wagon was available me and 450K other owners would have looked at it for sure. Mazda is a bit late to the game, sales would have skyrocketed on a diesel wagon. Wife and I have already discussed trading the sedan in for a wagon when they hit the market in the states. And no, nothing I own stays stock for long. aneville11 and Jomar23M6 like this. A Miata Soul in a 4 Door Sedan Body.. Car & Driver recently went to a press event in Japan to test a CX5 with the new diesel. 174HP and 310LB-FT of torque are the estimated specs, which they reported are close if not exact to the US specs. Sadly, the CX5 will only be opted with the ATX. I have a bad feeling the 6 won't see much change in that, if it gets the diesel.